Love Waltzingmouse Big Berries: Strawberry. Just a peek of it looks so fresh. How to get the shaded strawberry? I used the MISTI. I stamped first with a pale pink ink, and then inked up the edge of the strawberry with a darker red and restamped. Did the same with the green stem. If you have the $$ and are able to get the MISTI, do so! HUSBAND'S COMMENT = "It's a happy card. I like it." Adorable card, Joan. Looks so summery on this delayed-start icy day! there's something about strawberries...makes me happy. Love the stamping. I love it Joan!! I've been eying up that misti thing, looks interesting and seems to work great!!! hugs! Lovely card Joan! I hadn't thought about how the MISTI would make it easier to shade. Mine is already on order - can't wait for it to arrive! I've heard lots of rumbling about the overseas things. Definitely sounds like some things will be changing. I love this card! It is so cheery and brings back good memories! Beautiful card--I love how you have changed the color on that strawberry. And, wow, the EU tax situation sounds like a nightmare. He's right it really is a happy card. 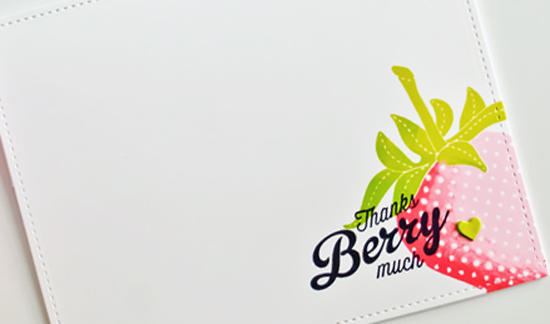 I love the two toned stamping on the strawberry and the placement too. 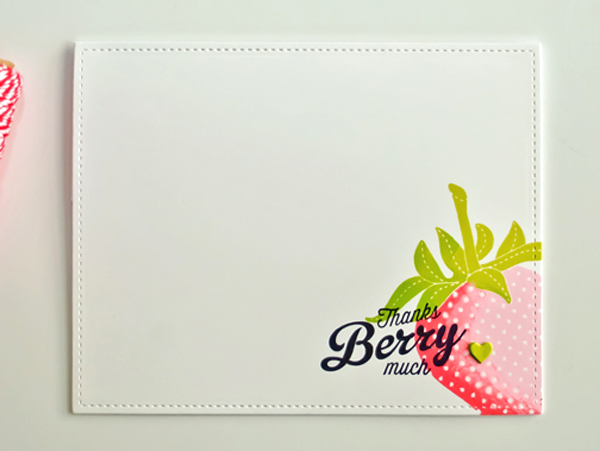 I love everything about this card....the white base, the stitched border, and the partial strawberry in the corner. Perfection! My misti is on order! The tax situation in the EU sounds too complicated to actually work. This past Christmas I bought items from English crafters/artisans and had the sent to my English family. As I am the purchaser the tax would be paid in the US? Odd or does it just apply to other EU countries and then do I pay tax at all? Good question. I do not know the answer though. Sounds like a nightmare.